Long-time Spielberg collaborator John Williams has a history of composing some of the most iconic scores in film history; Star Wars, Raiders of the Lost Ark, Jaws, Superman, E.T. the Extra-Terrestrial, Jurassic Park, and Harry Potter and the Sorcerer’s Stone were all brought to life by his incredible music. In his old age, Williams has slowed down a bit, but his scores to the 2011 films War Horse and The Adventures of Tintin were just as excellent as always. With War Horse, he took a more minimal approach than he typically has in the past, relying on gorgeous strings and warm brass to bring a feeling of intimacy to the film that fit the tone of the film. He uses this same approach with Lincoln, and the result is breathtaking. The music in Lincoln perfectly embodies the American spirit. There is grandeur, there is majesty, there is conflict and resolution, there is emotion…Williams has captured it all. Much of this album is more solo-oriented, which helps with that intimacy that I mentioned before. The first track, “The People’s House,” opens with a single clarinet melody, low and calm, evoking visions of long hours spent in the Oval Office making decisions for the better of the country. Throughout the soundtrack, we are treated to solos from clarinet (“The People’s House,” “Equality Under the Law”), trumpet (“The Purpose of the Amendment,” “The American Process”), horn (“The Southern Delegation and the Dream,” “Father and Son”), and piano (“The Blue and Grey,” “Remembering Willie”). Each solo instrument brings forth a different emotion, enabling Williams to exploit these associations to accentuate the feelings in a particular scene. These emotions are made even more powerful once the solo instrument is joined by the full orchestra; the strings bring a warmth that reminds me of family and responsibility. “The Blue and Grey” (obviously referring to the uniform of the Confederate Army) is a somber sort of track that hints at the tension between the Union and the Confederacy, while “With Malice Toward None” conveys Lincoln’s sense of duty to his country. “Father and Son” goes on to highlight Lincoln’s tentative relationship with his son in the midst of his presidential responsibilities, a sentiment that is continued in “Remembering Willie,” a terribly emotional track that echoes the grief felt by a distraught mother and her empathetic husband. “Appomattox, April 9, 1865” captures a grand moment in history with the timidity appropriate for such a solemn occasion, and it also expertly uses a choir to represent the almost spiritual element of the occasion. Just on a quick aside, there is a short motive heard throughout the film that sounds nearly identical to a similar motive from Randy Newman’s score to the Disney/Pixar film A Bug’s Life. Compare this from “The American Process” to this excerpt from “Flik Leaves” on the soundtrack album for A Bug’s Life. Also, considering the fact that Abraham Lincoln is buried in Illinois, I thought it to be a nice touch that this score was appropriately recorded by the Chicago Symphony Orchestra. I could go on and on and on some more about this soundtrack, but I digress. It should be obvious that I think quite highly of Mr. Williams and his music for Lincoln. I think that it perfectly represents all of the complicated aspects of one of America’s most celebrated presidents: his dedication to his country, his love for his family, his moral dilemma in doing the right thing. 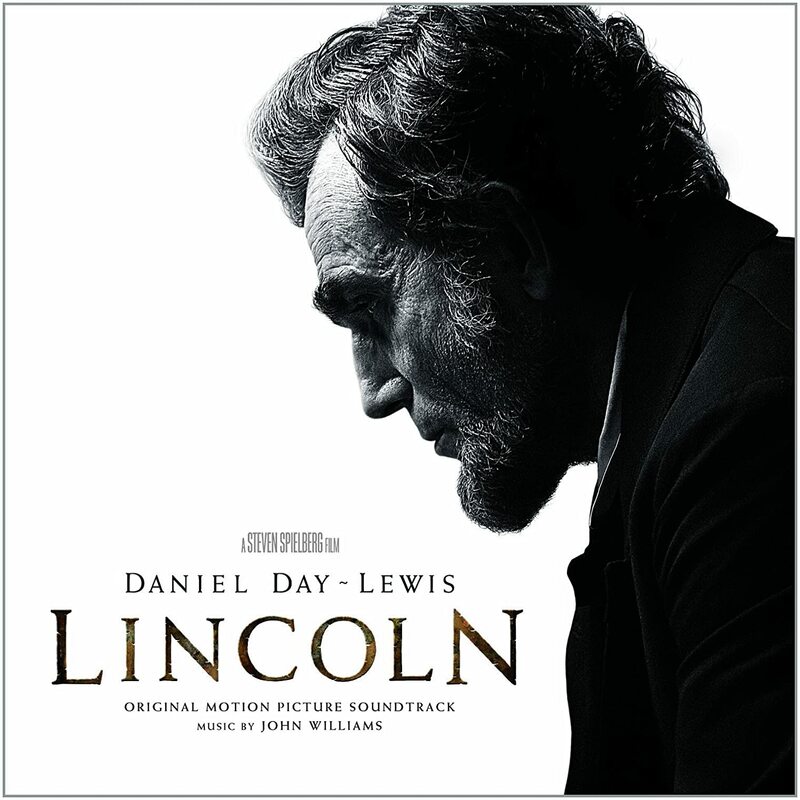 John Williams’ score to Lincoln is film scoring at its very finest, proving that, even at 83, he’s still got it. Total Length: app. 59 min.